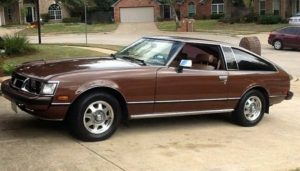 If you are old enough to remember when a Japanese car looked like an oddity in your neighborhood then you understand what a revolution the decade of the 1980’s was for a smallish car company named Toyota. No one saw it coming. Not behemoth GM, nor the standard bearer Ford or the innovative heads at Chrysler. Not even my Dad. This was a time when American manufacturers had a befuddling proclivity at making lackluster cars with questionable engineering. Perhaps it was their penchant of prioritizing quantity over quality as a central tenant of the car building process. Detroit made a feeble attempt at filling a niche they didn’t even believe in. They had the uninspiring Ford Aspire, the dreadful Chevrolet Cavalier, the bumper-car look alike Geo Metro, the hideous Chrysler K car and finally the haphazard Cadillac Cimarron which masqueraded as a luxury car, but only for the destitute. They were so bad that none of those names exist anymore. Banished from the memories of the automotive world like a bad trip. In the end the field was wide open for a car company that could reinvent the process of building cars in a better way. Indeed that better way had already been quietly invented long before in Japan. It was called The Toyota Production System (TPS), and when it finally hit the American shores it transformed the entire automotive world. Toyota knew something the American car companies did not know, and it was big. From the get-go one thing was perfectly clear; Toyota was able to build inexpensive cars that were utterly and undeniably reliable. Not necessarily fancy or cutting edge, but precisely constructed, high quality, low maintenance cars that could, and surely did, outlast the American counterparts. Essentially Toyota was brilliant at assembling 35,000 high quality parts that make up a truly great car. What did Toyota have that these other car companies lacked? In a word; Kaizen. Quality control is at the heart of every successful business and there is no other company that does it better than Toyota. Any expert in the field of automotive manufacturing will agree that Toyota quite literally wrote the book on how to achieve the highest quality production standards. How this came to be is a compelling story that dates back to the humble beginnings when Toyota was a fledgling company and dominated by Detroit. At that time Toyota was manufacturing their cars in Japan with a revolutionary quality control program. The Japanese called it Kaizen. This simple word embodies the philosophy of “Constant Improvement” which has since become the envy of the automotive world. In fact American manufacturers have made every attempt to try and copy the Toyota Production System which features Kaizen at the heart of the process. Some have been more successful than others but no company would be able to match it. It is as much a philosophy as it is an action. The word Kaizen sums up the entire big picture approach that Toyota lives by. From management to design, right down to the production floor, it is practiced by every one who works there. It is even practiced by every parts supplier Toyota uses. It is demanded of them because it is the highest form of quality control and Toyota accepts nothing less. Kaizen is incremental by nature and has many facets which builds upon itself. One of the strongest aspects of Kaizen is that it empowers employees with respect for suggesting improvements. This means that every employee on the production floor is empowered and entrusted with decision making and has the responsibility of calling out quality control problems (as opposed to hiding it) and assisting in implementing improvements. Any employee can, and is encouraged to stop the assembly line process in the event a defect is observed by simply triggering the “Andon System” which stops production in that station. When the Andon button is pushed management will converge and, with the help of the employee, perform genchi genbutsu, which is Japanese for “problem solving at the source”. Getting to the root cause of a problem is achieved by asking “Why?” five times, going to a deeper level with each “Why?”. Most problems reveal themselves superficially but the core problem actually hides much deeper beneath the surface. The “5 Whys” dig down into the problem identifying the root. Production does not commence until the root cause of the problem is identified and resolved. This procedure prevents a defect from continuing to the next production station. The Japanese have a term for that as well. Its called “Jidoka”. Quality control is imbedded in every detail. It is an investment that has long term payoff at the expense of short term gain. This is in stark contrast to other assembly lines where halting production is taboo. Calling out problems as an employee is essential and looked upon as practicing kaizen. This assembly line stoppage and containment procedure ensures that the observed defect does not get transferred down line. The fact that employees are encouraged to stop the assembly line makes every single floor employee important. Not only are they important but they feel important because they have immense responsibility rather than just being someone who puts parts together with no real role in the overall quality of the car. Giving respect and power to all employees yields productive and loyal employees as well as higher levels of quality control. It would be easy to understand how constant improvement should be the modus operandi of any company, but at the time in the 80’s all the other manufacturers were using an archaic Fordtonian style of assembly line processes that emphasized volume as a means towards profitability. There are many reasons Toyota succeeded as quickly as they did but making quality as a means towards profitability is the paramount reason. No doubt all companies strive for a certain level of improvement, but it is not so easy to copy a deeply ingrained philosophy such as Kaizen and make constant improvement the very essence of the business. If you as a person strive to be a better person you will practice Kaizen daily. You are always trying to improve your life, better your relationships, improve your work habits, do physical exercise, etc. That would be you practicing Kaizen. However it is a philosophy that escapes the person who is content to be lazy and not take any action on improving their lives. In the case of the Big Three auto makers, improving the quality of their cars had reached the limits. Toyota had figured out a way to break through those limits and just like that revolutionized, not only the automotive industry but every industry that uses assembly line processes. All the successful assembly lines of today’s high end manufacturers, regardless of the product, utilize a form of The Toyota Way and Kaizen. Emulating and practicing Kaizen is difficult for any car company. To truly adopt the Kaizen philosophy one would have to change the perception of every employee. Kaizen is as much a philosophy as it is an action. Indeed, lack of kaizen would be considered a systemic problem. It takes time to develop all the systems that make up Kaizen. By the time Toyota had made its entry into the U.S. market they already had decades of experience at refining quality control under their belts. And it showed. In the late 90’s at the behest of a little known Toyota employee named Yukiyasu Togo, Toyota formed Lexus. The new division would be led by Ichiro Suzuki who was the highest level engineer that Toyota had. It was a formidable challenge to push Kaizen to new levels by competing with Mercedes Benz, BMW and Audi. 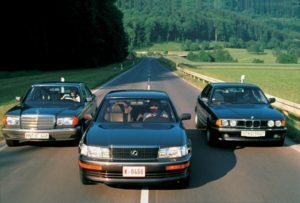 In 1989 Lexus debuted the stellar LS 400. This was the same year GM stopped producing the ridiculous Cadillac Cimarron. With the LS 400 there was little doubt about the quality and high level of engineering and sophistication that Toyota had implemented in such a short period of time. In fact with the advent of Lexus, Toyota was able to exceed the quality and engineering standards of any other manufacturer at the time, notably the dominant players of Mercedes Benz, BMW and Audi. The early 80’s were heady years for these German manufacturers who were caught completely off guard by Lexus which quickly become the benchmark for luxury and sophistication YET still be affordable and in true Toyota fashion, perfectly reliable. In fact Lexus instantly outsold Mercedes Benz, BMW and Audi in the U.S. three years in a row. You can only succeed on this level by doing everything right and Toyota knew the formula. Everything that Lexus was embarking on they had Toyota as the bedrock to their growth. There is no question that Lexus took the notion of Kaizen to a whole different level. It was indeed the pursuit of perfection. With Lexus, Toyota was set on competing and later dominating these luxury manufacturers and beating them at their own game, but they also were well on their way to getting a substantial piece of the U.S. market share from the big three in Detroit. By the year 2000 Toyota was soundly beating all the other manufacturers with small cars (Corolla), family sedans (Camry), mini vans (Sienna), small SUV’s (Rav4), off road vehicles (4Runner), the perennial green car leader (Prius) and the entire luxury based Lexus line-up of the LS, ES, RX and LX. All still being made with the constant improvement philosophy of Kaizen. Building the highest standards of quality into a product will result in a successful company. That is the long game that Toyota plays. That is what has made them into the dominate player in the automotive world. Kaizen, it is a word you should remember.